Erase is a powerful spray system cleaner that exceeds the capabilities of ordinary tank cleaners. Erase emulsifies oily residues in sprayer lines and hoses while elevating rinsate pH to degrade vulnerable plant protection products. 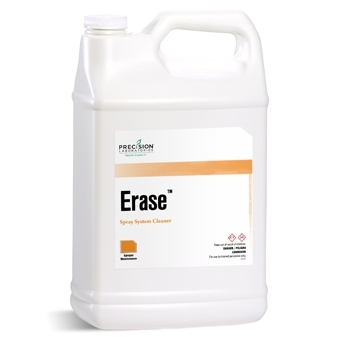 When used in conjunction with proper sprayer clean technique, Erase ensures more thorough clean-outs. Erase also is effective at removing stains left behind by pigments and dyes from sprayer and equipment surfaces. 1 quart per 50 gallons of rinsate.